Asset Catalog Creator takes any image and creates a full set of icons, launch screens or pretty much any other type of image that you’ll need to make an app on any of Apple’s platforms. Unlike other icon generators, batch resizers or scripts, these are converted directly into the latest Asset Catalog format; eliminating any additional steps before they’re ready to use. As of iOS 12, there are 26 different image sizes needed for a universal app icon as well as another 26 different splash screen dimensions! Even if you already have an automated way of batch resizing images it’s a tedious process to identify and drag all of the files into their respective places and then deal with any misfitting sizes. Asset Catalog Creator is configured with well over 100 image dimension requirements so you’ll never need to look a size up again. Asset Catalog Creator is designed to be quick and easy to use and fit seamlessly into your workflow. All you need to do is add an image, point the app to where your project is, pick your icon type and export. The app finds the existing asset catalog(s) and has advanced merging abilities that allow it to append or overwrite based on your choices. 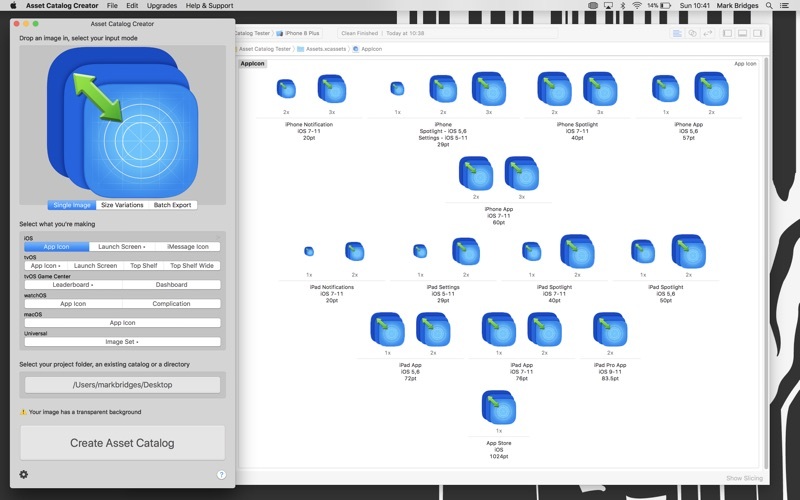 If you’ve never used Asset Catalogs in your apps before, now is a great time to start. 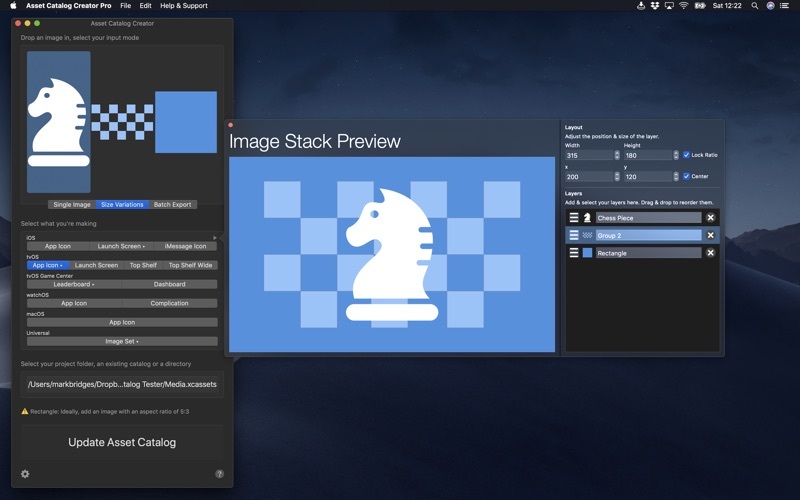 You’ll find managing and organising your image files much easier and you’ll also benefit from improved performance and reduced app install size, thanks to the smarter way asset catalogs are compiled and archived into binaries. Continuously updated for the latest asset; currently, iOS 12 with iPhone Xs, Apple Watch Series 4, iPad Pro and 4K Apple TV icons etc. 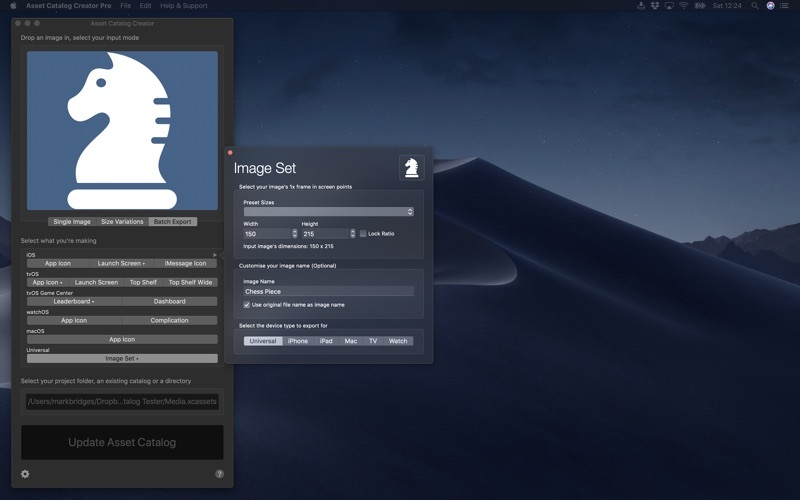 Advanced image validations, letting you know when images are to be upscaled etc. Preset image sizes for assets used in-app, i.e. tab bar button size, nav title size etc. 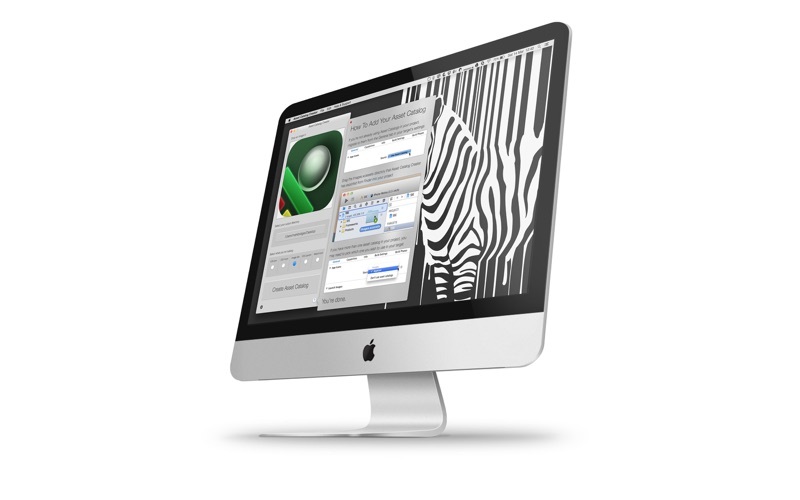 The app is available in two different versions, Asset Catalog Creator & Asset Catalog Creator Pro. Both versions have an identical set of features but have different pricing structures to suit your preference. 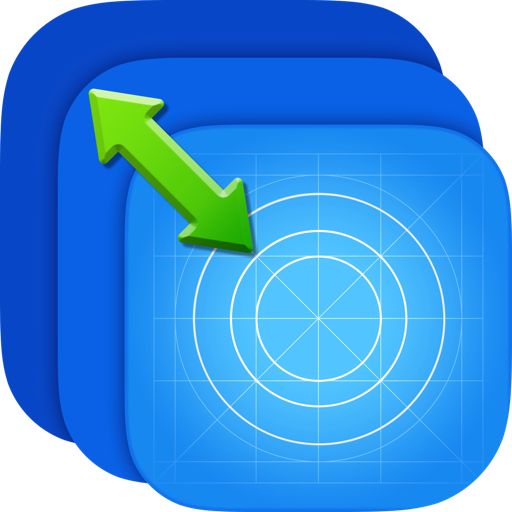 Asset Catalog Creator gives you the ability to make iOS app icons out-of-the-box and you need to unlock the ability to create each additional type of icon via in-app-purchases. The in-app-purchases are all non-consumable so will be unlocked permanently and can be used across all of your computers. The difference with the Pro version is that every type of icon etc. is unlocked out-of-the-box and there is nothing additional in the app for you to purchase. Improved prompts to review and links into the App Store. Just a small update this time. You’re now prompted to sign up to my mailing list; I hope you will. I've finally gotten to the bottom of why everyone was getting prompted to view my other app's so much; it's fixed now. 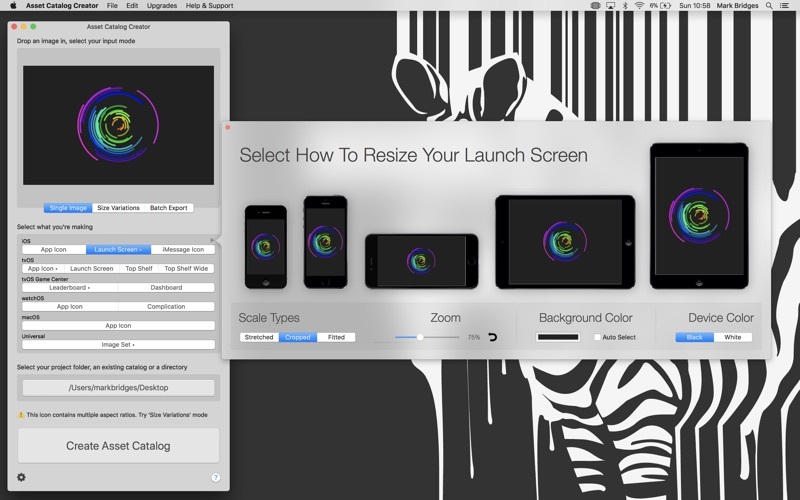 Additionally, the splash screen previews not updating when the scale type is changed is also fixed.